Hy Meador, who passed from us in January of 2011, was a long-time member of the Metro Zen Community and the Clear Mountain Zen Center. Hy was a wonderful soul who embodied the true spirit of practice. He faithfully came to sit every week for years and years, even when he could barely get around with a walker. 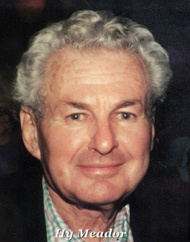 As a young man, Hy became a very accomplished and successful individual. He founded a tax accounting firm in Manhattan and was a member of the Professional Public Accountants Association. Mr. Meador was a World War 2 Army veteran, and was awarded both the Purple Heart and the Bronze Star for his service. He was also a founding member of B'nai Keshet Synagogue (before he died, Hy helped our sangha establish a relationship with a local Rabbi whose congregation has an interest in mindfulness meditation). Even in middle age, Hy was open to new challenges; for instance, at the age of 55, he trained for two successful New York City marathon runs, finishing each in under 4 hours. In the same spirit, Hy came to Zen in mid-life and took on its rigors and challenges without complaint. He did not offer polished words and concepts, nor pontificate about his path toward enlightenment. He just came, sat, and shared the moment with us. When he did comment during a practice circle discussion, he often asked the common-sense questions of a man relaxed and settled in his own simple being. In not knowing the answers, he knew. In offering kind and simple friendliness to both long-time sangha members and new aspirants alike, he evidenced a profound awareness. John Flynn was largely responsible for bringing the practice and tradition of Zen to Montclair. Mr. Flynn had earned a PhD in philosophy and also an MSW degree, then pursued a dual career as a philosophy professor and a therapist. During the 1980s, Mr. Flynn taught philosophy at Livingston College near New Brunswick and worked with St. Clares Behavioral Health Services in Morris County in the field of family therapy and relationship counseling. During the mid-1980s, Mr. Flynn collaborated with Ray Cicetti, a licensed CSW and future Sensei at the Empty Bowl Zendo in Morristown, to develop and enhance the application of family systems theory at St. Clares. Mr. Flynn was familiar with eastern thought and with Zen koans via his philosophy studies, and Mr. Cicetti had become interested in the nascent Zen movement in America and had read several works about Zen by authors such as D.T. Suzuki and Alan Watts. They came to realize and share their common interest in the Zen tradition, and both saw opportunities to use aspects of that tradition to enhance patient therapies and foster the understanding of family / relationship dynamics from a systems perspective. The family systems movement in psychology was taking hold at the time, and both Mr. Flynn and Mr. Cicetti recognized the common ground and synergistic opportunities between systems thinking and holistic Zen wisdom. At first, their efforts involved a continued study of the writings of various Zen observers and practitioners, both modern and ancient. After a while, however, both realized and agreed that to truly know Zen, they must actually do Zen; they soon arranged for weekly sitting sessions in Mr. Flynn's residence in Montclair. Mr. Flynn and Mr. Cicetti proceeded mostly from what they had read and heard regarding Zen, without the direct guidance of an experienced teacher. They obtained a bell and some floor cushions, along with incense and a Buddha statue, and committed several hours weekly to sitting in silent awareness of their breath. In their professional lives, Mr. Flynn and Cicetti continued their efforts to study the koans and precepts, and to integrate Zen wisdom into the understanding, training and praxis of therapy. As part of this, they gave a variety of talks to professional groups; interestingly, future Clear Mountain Sensei and professional therapist Carl Bachmann had attended one of their lectures, although he would not affiliate with their growing Zen community in Montclair for several years yet. Over time, more people found out about their weekly sitting sessions and joined in, and a more spacious location was needed. In the early 1990s, the group was allowed to use the Montclair Co-Op School building on Sunday mornings, when few if any school activities would occur. At the same time it obtained its identity as the Metro Zen Community. John decided to reach out to the public, spreading the word that a Zen sangha in Montclair was available to anyone interested. In addition to publicizing this group amidst his professional colleagues, he gave talks about Metro Zen at the Montclair Adult School and arranged for an article in the Montclair Times newspaper. John and Ray also reached out to Robert Kennedy, S.J. of St. Peters College in Jersey City, after by chance reading an article in the New York Times about Father Kennedy's installation as a Zen Sensei (teacher) by Roshi Bernard Glassman in 1991. Their growing affiliation with Sensei (later Roshi) Kennedy allowed the growing Metro Zen Community to access a direct Zen lineage via the White Plum Asangha, which traces its ties to Japanese schools of Zen through the late Maezumi Roshi. In the late 1990s, Mr. Cicetti had left Metro Zen to form a Zen sangha serving the Morris County area where he lives. By 2004, Mr. Cicetti was installed by Roshi Kennedy as a Sensei and continues to serve as the lay teacher for the Empty Bowl sangha in Morristown. Mr. Flynn continued on with Metro Zen as the Twentieth Century came to a close, continuing to gain new members and sponsoring activities such as sesshin weekend retreats. Unfortunately, Mr. Flynn was struck with illness soon thereafter, and passed away during the summer of 2002 at the age of 62. He left behind his wife and fellow therapist Diane, a son and a daughter, and a continuing and growing Zen community in Montclair. Several years later this community would find its own physical space downtown near Lackawanna Plaza, and take the name “Clear Mountain Zen Center”. It was John Flynn's dedication to integrating western analytics and eastern holism; academic study with humanistic practice; professional development with personal involvement; and meditative insight with personal healing and growth that set the standard for today's on-going Zen communities in Montclair and Morristown. Because of his dedication to this vision, the Clear Mountain Zen Center and Empty Bowl Zendo continue to offer a path to awakening and awareness that accords with the traditions of the East, while fully relating to the challenges of life in New Jersey in the 21st Century.